I've had this turtle art for many years and finally had the time to use it. 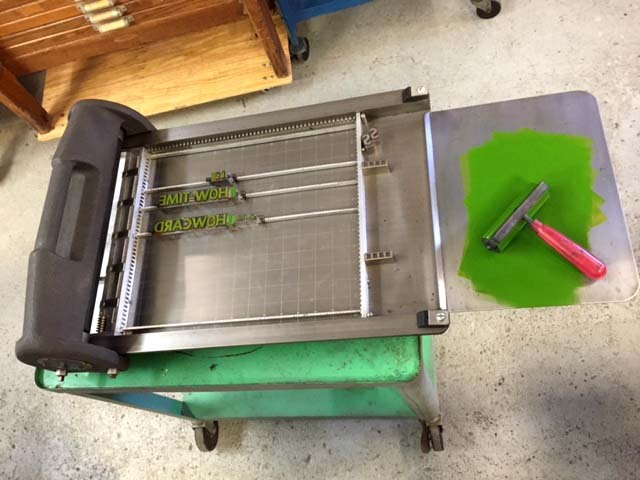 I set up two presses so that I could print the background color in register with the line art. My projects usually take a path of their own and this one was no different. 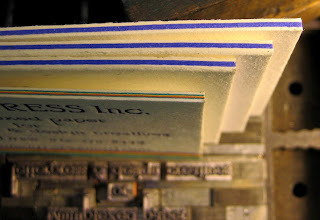 When I started out I was only going to print a couple hundred cards with a yellow background. After 100 cards I thought maybe a little dab of blue ink on the disk would give it a transition of color, like an actual turtle shell. 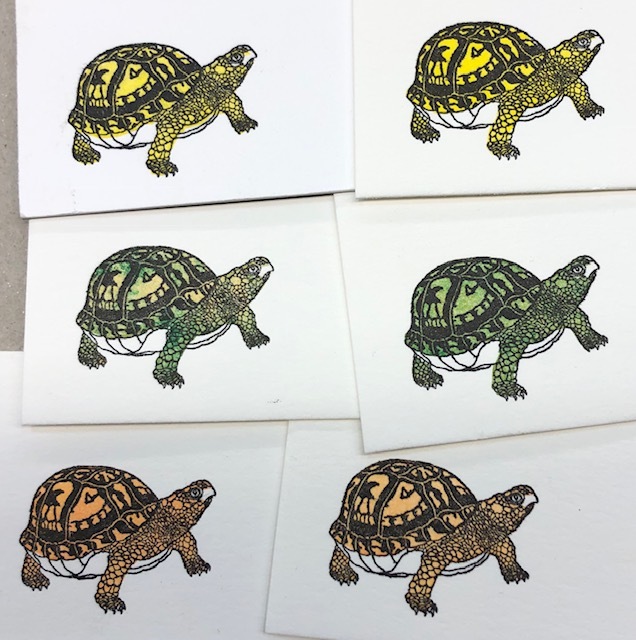 I ended up keeping the job on the press for over three days experimenting with different colors and ended up with over 1,200 cards (shells). I can't wait to see what path they take. 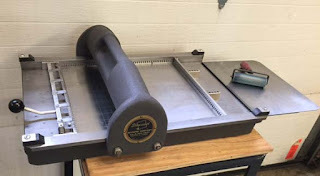 I made two videos showing the two press set-up. The first 3 months of Ivy love. 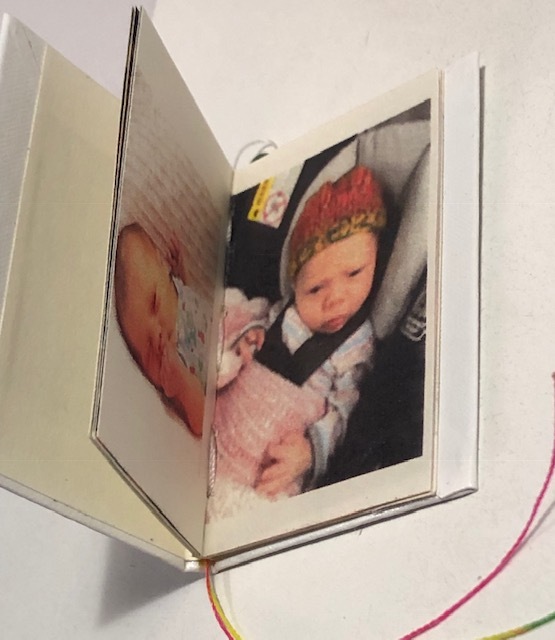 After my grand niece Ivy was born the baby pictures started to show up on my phone. 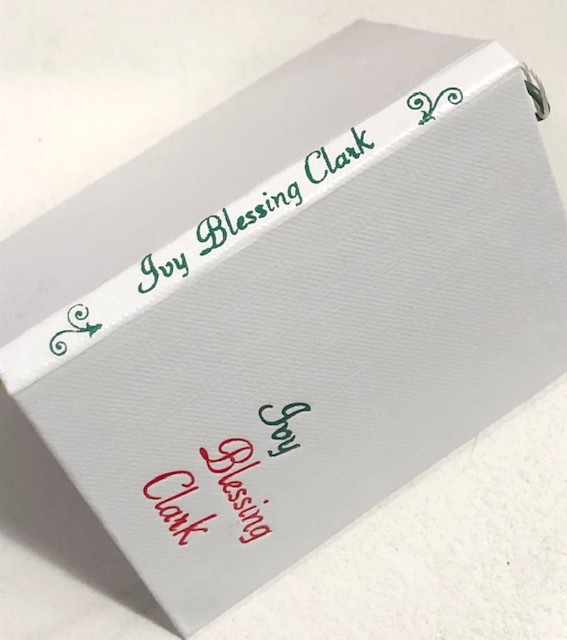 Right away I knew I wanted to make something special using the images and my rudimentary skills of letterpress and bindery. The size of the book was determined by how small I could edit the pictures and still hold their visual detail. 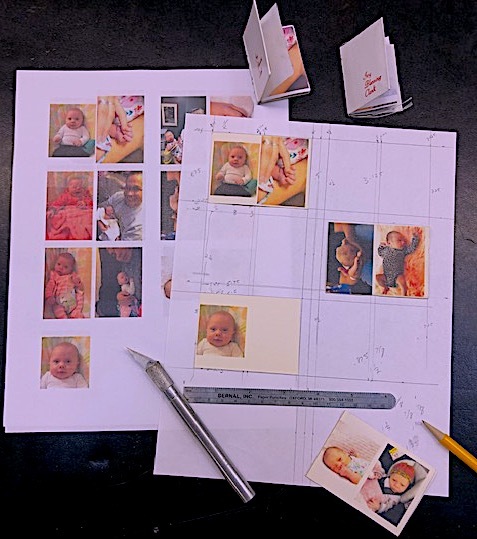 I arraigned the images in an order that felt to me like a story without words and then drew up a pagination layout. .
After printing the pictures the pages were cut, folded, collated, trimmed for the inside pages of the book. 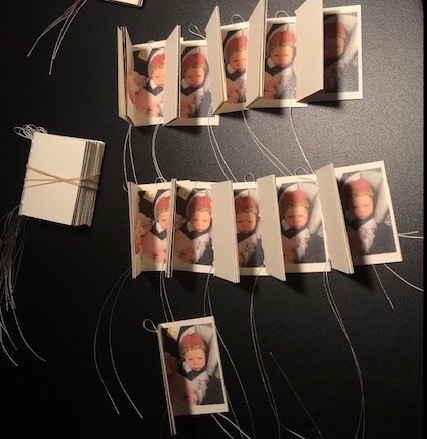 I stitched the pages together leaving a small loop at the top for an ornament hook so that the book could be hung onto a Christmas tree. With the inside pages ready I could determine the size of the covers & how I was going to decorate them. I was running out of time to finish the project so I went with simplicity. I stamped Ivy's name on the spine using 12 point Piranesi Italic and two little ornaments and matched it with 18 point on the cover. I stamped the spine copy first so when I wrapped the covers the copy would be centered. 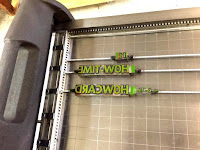 After the covers were wrapped I hot foil stamped Ivy's name on the front. Long story short, I then glued the inside pages into the cover 'case'. Colored the tassels, attached the ornament hook, made a die cut card case to hold the little bugger and just like that they were done. Free Range Letterpress is the name of a portable letterpress printshop. 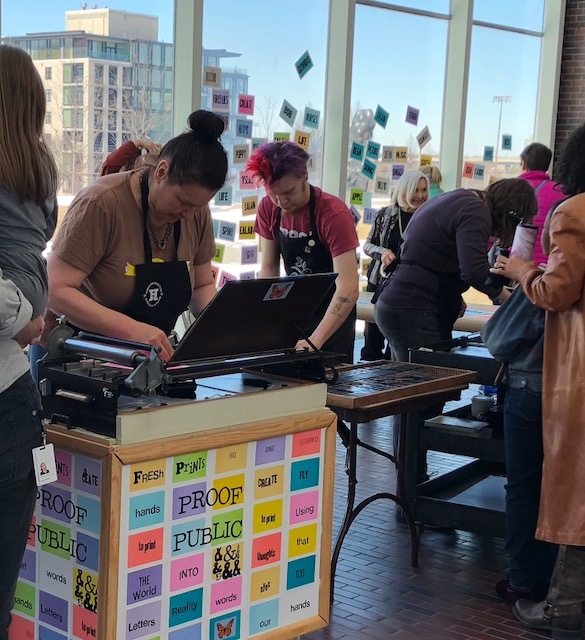 The shop consists of a beautiful Line-O-Scribe, Showcard Writer proof press on a custom rolling cabinet. .
< F R L at Walker Art Center. The panels on three sides can be branded with signage to fit any venue. and the unlimited color selection from the ink mixing station. 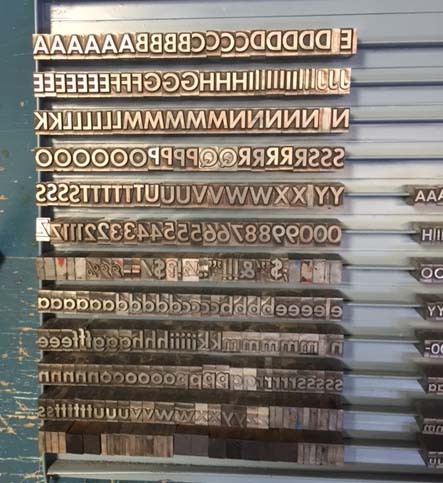 The Making of my sisters business card starts in about 1964. Nancy was an artist and in high school she wanted to take the Graphic Arts (letterpress) class. She was informed that the class was only for boys. Eventually the teacher (Bob Papas) advocated for her and, along with another girl, became the first female students at Southwest High School to take the course. 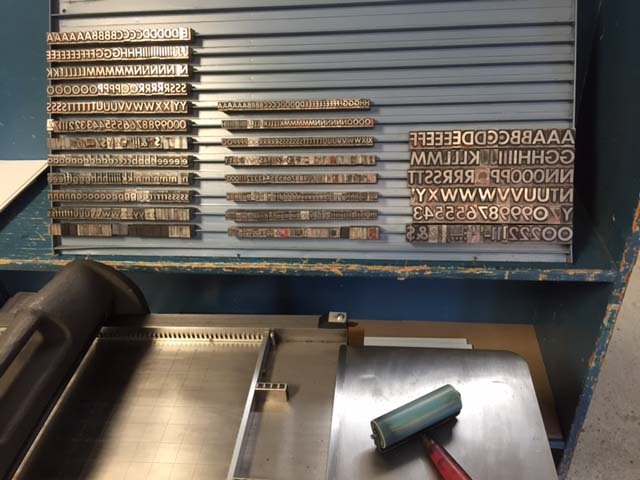 The next year my brother Chris took the class and liked it so much he asked for a letterpress for Christmas. 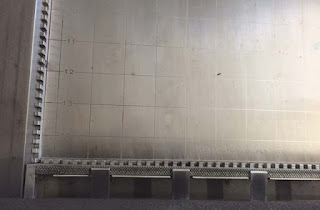 I was in 5th grade at that time and was also bitten with the bug to print. My younger sister Mary also took the class, becoming the fourth child in line to take up the craft. 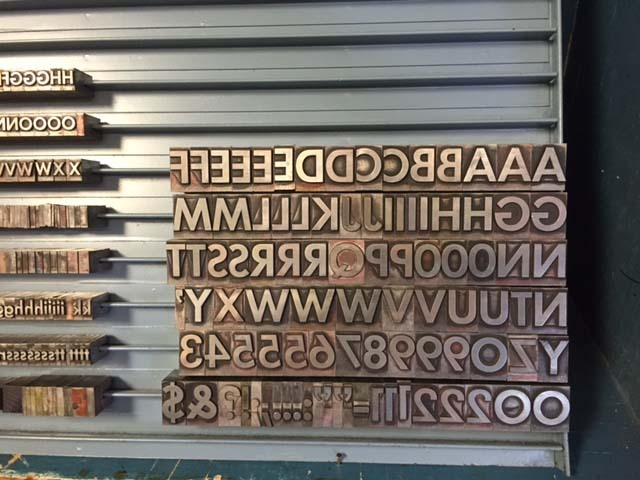 I kept in touch with Bob Papas through the years and upon his passing inherited his press’s and type collection. My sister is now a quilter and collector of antique sewing machines and loves her cats. She lives on a farm in North Dakota. during the summer she has a large, colorful, flower garden. material to back up her cards. She also provided me with the image of a pair of ornate scissors she wanted on her cards. 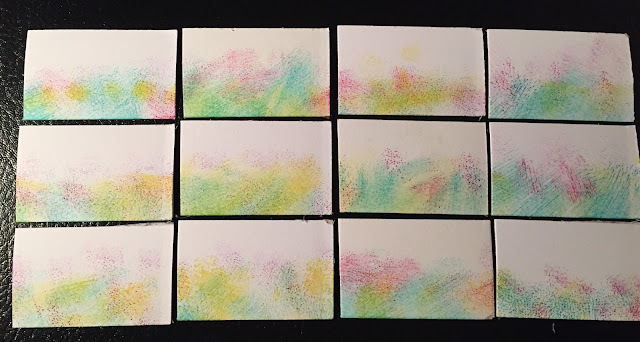 I started the cards by duplexing the fabric to a very thick soft cotton cardstock. I wanted to give them a little ‘depth’ so I added a multi-color background wash by applying a little ink to a piece of cloth and lightly brushing each strip of card stock, this background represents her flower gardens. 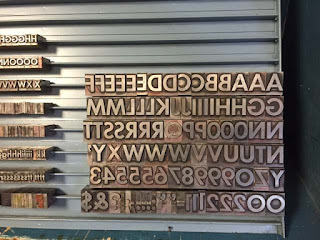 The cards were printed on on Bob’s 1886 Golding “Pearl” treadle driven, floor model platen press, using handset lead type from his collection. 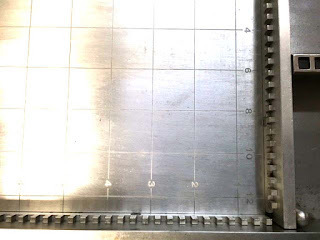 The scissor art was made into a photopolymer plate. This art was printed in a separate pass on a 1930’s era Sigwalt, table-top press which was previously owned by Bob Papas’ high school teacher. Junior Gossell. Multiplexed papers add what could be called the 'thump' element of design. These puppies add real impact. Don't drop them on your toe. 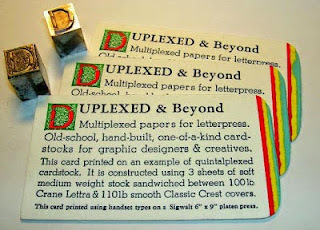 Duplex is the gluing of two sheets of paper to make a thicker, unique, custom sheet which can show off the very best examples of modern letterpress technique. 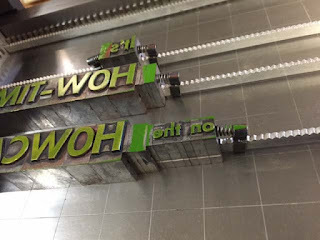 The commercial letterpress artist will like the depth of impression that can be obtained by duplex after printing, thus eliminating the impression bruising or show-through. 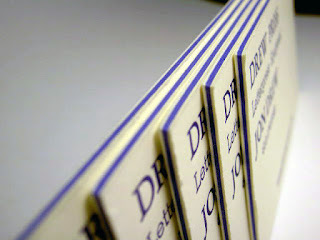 The designer will like the fact that they can offer their clients a custom, unique, one-off, card. 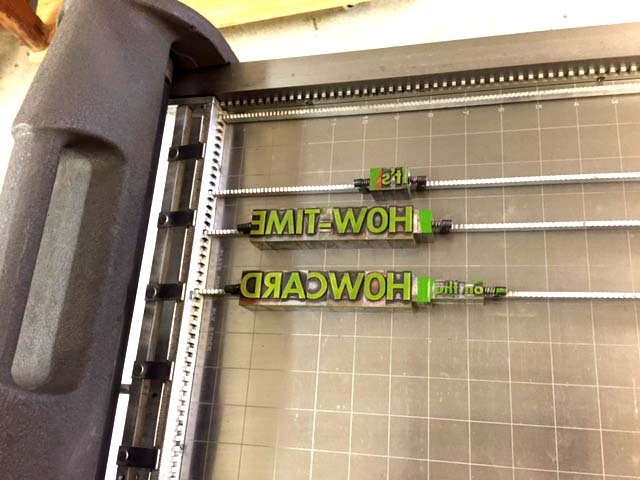 The hobby & old school printers could enjoy both of these benefits. 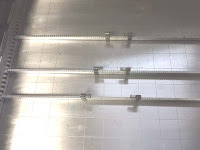 Or because their equipment or background training will not allow them to push the beastly impression of today’s fashion they have the added benefit of being able to duplex before printing without bruising or impression show-through. 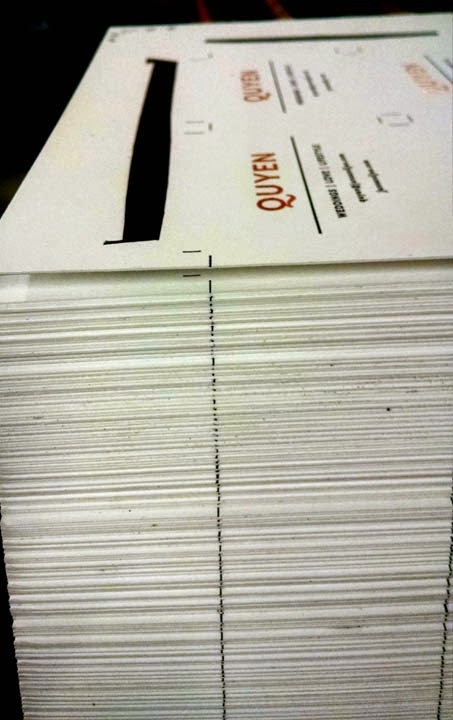 We can glue any stock from 20# text up. 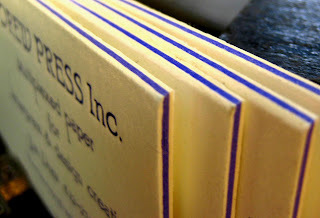 Even fabrics to cardstock. 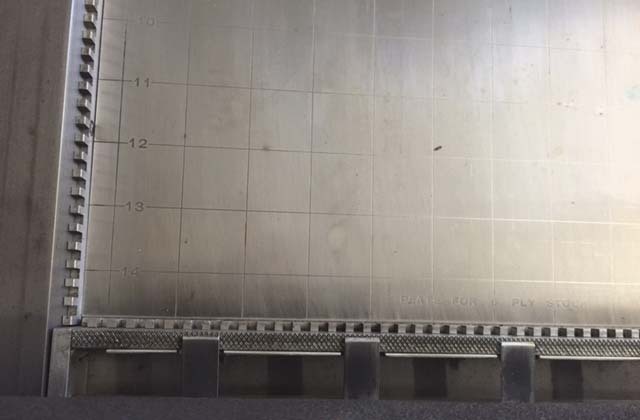 There is no limit to the number of sheets we can multiplex into one. 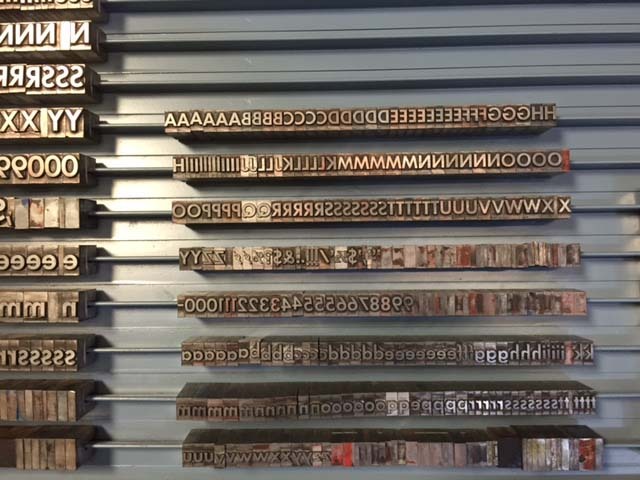 This article copied from the Excelsior Press Museum, Proof Press section. 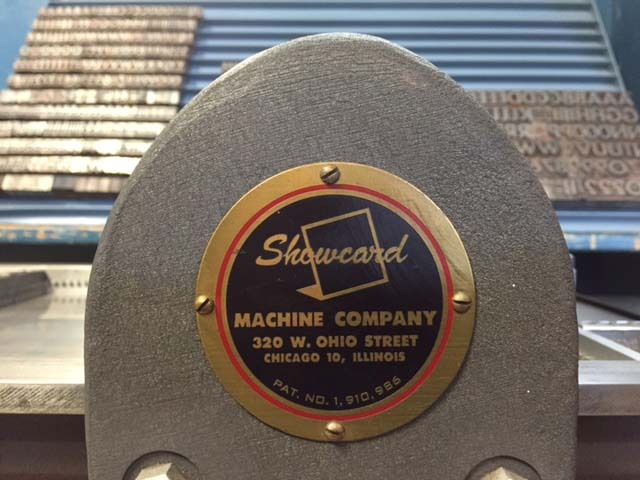 Notes about the Showcard--Vandercook Proof Press. This “Mini-Vandercook” Showcard press is actually a standard proof press in every way. In fact we discovered that it was a Vandercook because it is identical in design to the Vandercook Model 99 proof press – same design, same bearings, ect. – Just quite a bit smaller. 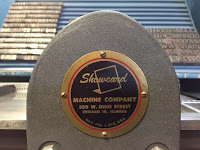 Fritz Klinke – current owner of the Vandercook/Vandersons name and records confirms a list of serial numbers assigned by Vandercook to these “Showcard” presses. This press can be used to print from any sort of standard type, linotype, Ludlow, engravings, photopolymer plates – any standard type high .918 type or relief plate. The special Showcard type, is in fact, regular foundry type with a slot cut into the bottom. The slot allows the type to fit over the square rods that form a removable, adjustable grid in the bed of the press. 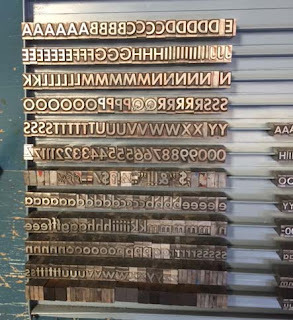 The Showcard Company expected that this press would be used to print small point-of-sale signs in department and grocery stores. 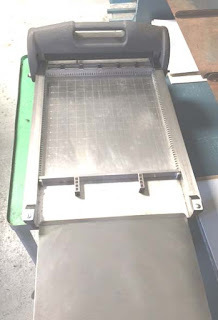 To make their equipment appealing to non-printers they developed an easy system of composition wherein the ‘printer’ would simply lay the type on top of the adjustable grid system which held it in place. 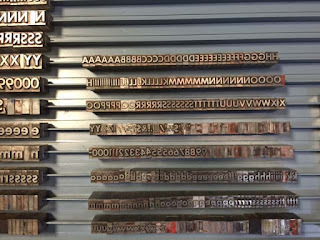 It’s rather clever, actually, but only needed if one has no idea how to set type or lock up a form. **Drew Press** offers custom duplex paper & more to letterpress printers. What does your card sound like? 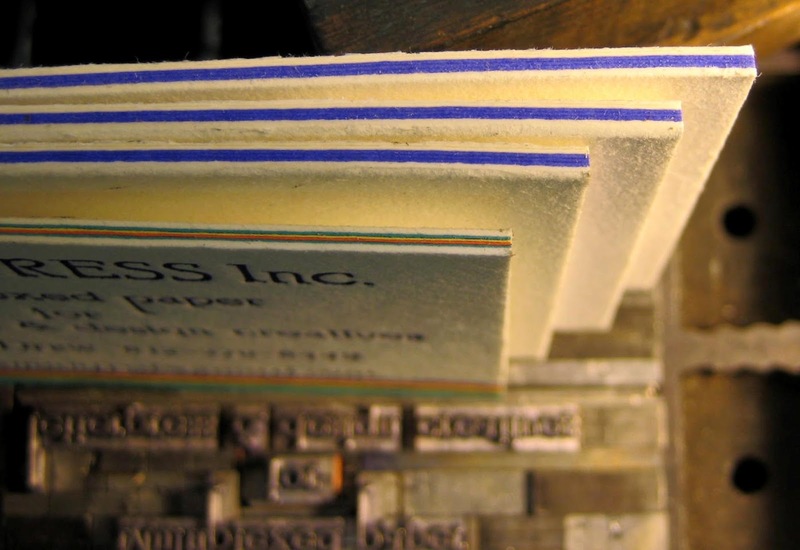 Drew Press uses old school bookbinding gluing techniques to create unique, one-of-a-kind papers and cardstocks for letterpress printers and graphic design creatives. 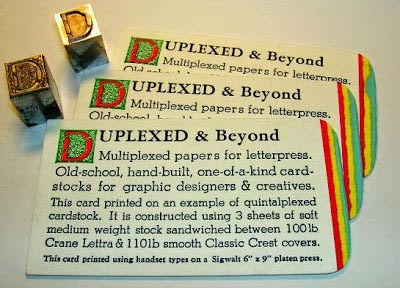 Pictured is a lift of duplexed cards.